In my last entry, Toto We're not in Tuscany Anymore, I told the tale of my fantastic trip to Venice last week. The fun didn't end there, as the next day I left Venice with Giulia of From Venice to Wine, and we headed to 3 different fantastic wineries, all in one day. Giulia met me near my hotel and we walked to the van outside the train station. From there, it took about an hour or so to get to the first winery, Pra'. 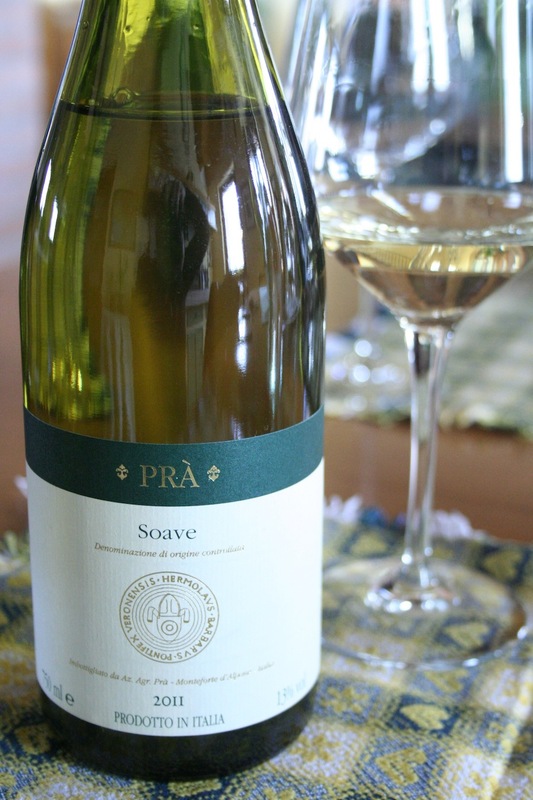 I sipped on a few Soave whites and tried their Valpolicella Classico. We were served sopressa, which in their neck of the woods is a soft, crumbly salame a lot like the sbricciolona of Tuscany minus the fennel seeds (both are delicious!). Dried river bed on the way to the 2nd winery. The next stop was at a much smaller winery, run by a Capricorn named Ettore. This guy is awesome. He has his way of doing things and that is just how it is going to be! For starters, the winery is in an area outside of the Valpolicella Classico (the original part of Valpolicella wine zone). As we drove up I thought "Where the heck are we, on the moon?" 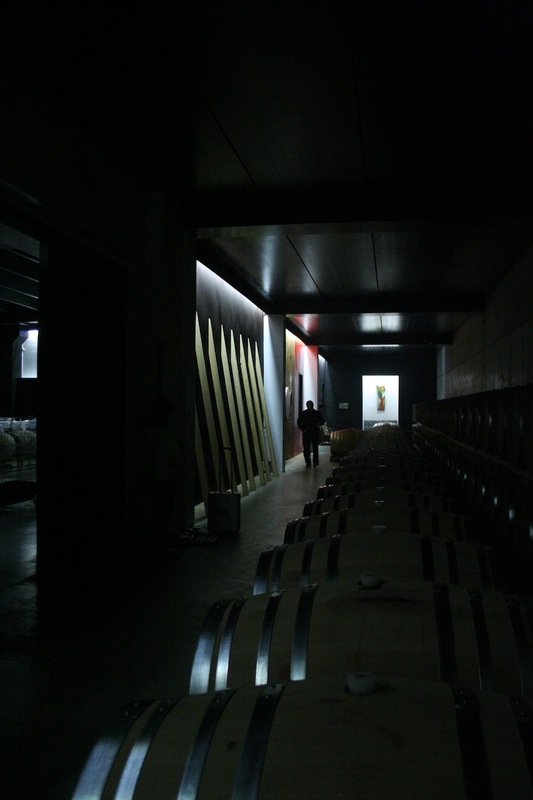 As soon as we walked into the winery I realized this was another world, and another type of wine making. Years back, Ettore was accidentally sent a barrique made of American oak. He decided to give it a try instead of sending it back. 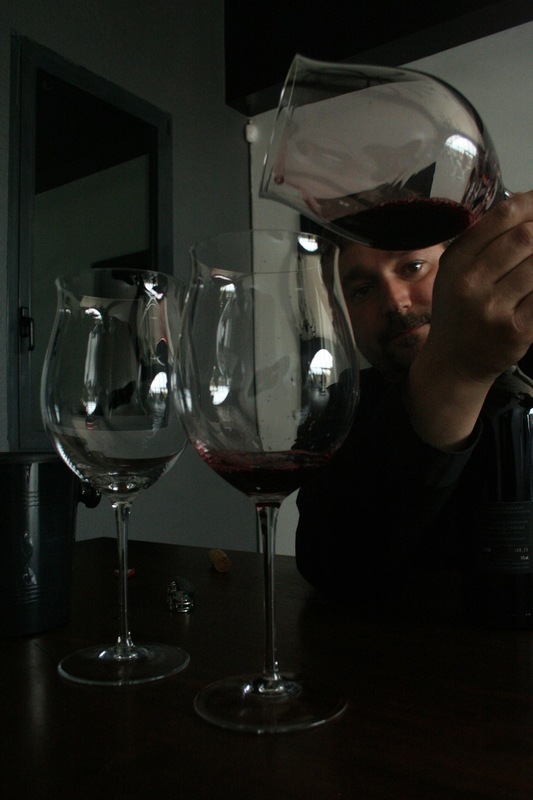 Since then, he uses only American oak to age his Valpolicella Superiore. Also, Ettore wants nothing to do with Ripasso. He refuses to produce it, even though he constantly gets requests from his exporters and wine reps.
Ettore preparing our glasses for tasting. The winery also doubles as a sort of art gallery. All the works were chosen by Ettore and his brother, and represent his beliefs on life and wine making. This represents our personal worlds. The colored dots are our friends and loved ones who help and the white dots are the rest of the people we do or do not know who cannot be counted on. I'll just throw in some more photos randomly, since I got a bunch at this winery that are worth sharing. Giulia and Ettore above the steel tanks used for fermentation. 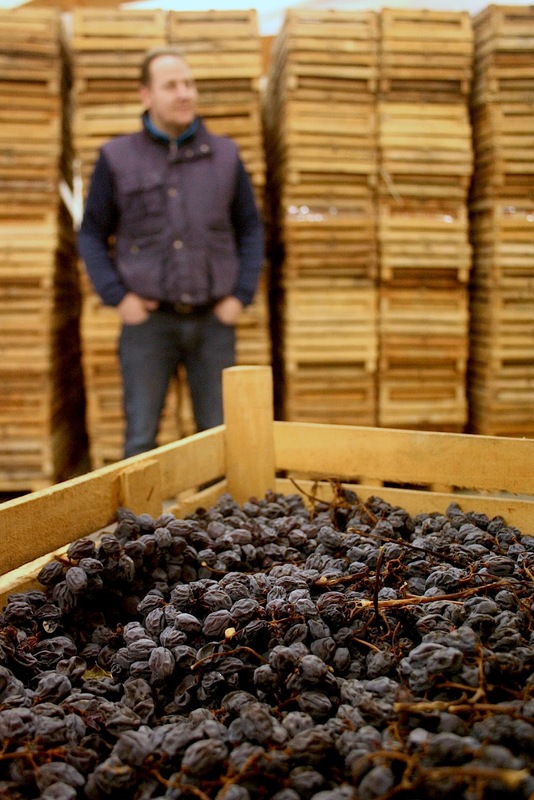 Black crates seen are used for semi-drying grapes before producing Amarone. 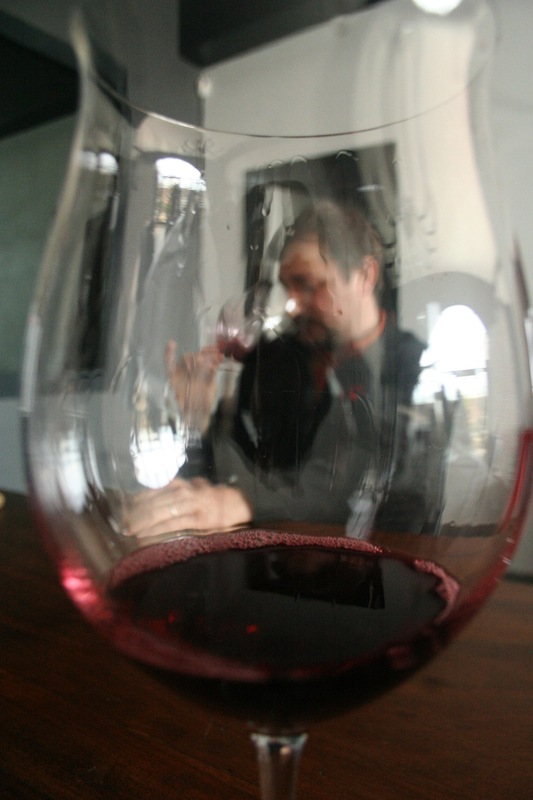 Ettore sniffing his fantastic Recioto. Before moving on to lunch and the next winery, I would like to mention that upon trying his Recioto, I exclaimed "cazzo che buono," which I will not translate but let's just say it wasn't very ladylike! This dessert wine is amazing. I bought a bottle, and Ettore had a huge grin on his face to hear my candid reaction! After a couple of glasses of wine, and me talking like a sailor, Ettore decided to join us for lunch. The three of us had a meal of Bollito Veronese, boiled meats of Verona. While they look and sound quite boring, quite the contrary. Horseradish, Green Tomato Mostarda, and Salsa Verde to dress meat. A Veronese dish made with bread, broth and bone marrow. All washed down with a Volpolicella Classico chosen by Ettore (drats! I didn't take a photo of the label!) By the time we were done I was in a total food coma. We hopped in the van, I fell asleep, and next thing I knew I was on the highest point of the Valpolicella at the 3rd winery. Can you imagine the hard work that goes into caring for the vines and harvesting the grapes on a terrain like this? This winery is much bigger than Ettore's. Alessandro has been at it for about 10 years now. The production he's running is quite impressive. 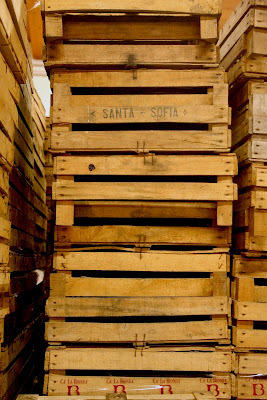 Alessandro showing us the wooden crates. 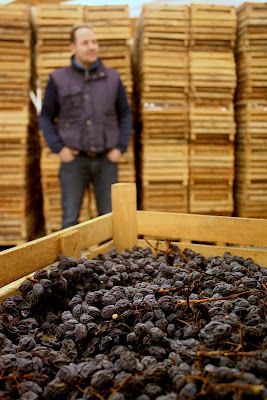 I'd say the most important thing to note is that Alessandro still uses the wooden crates instead of the plastic ones to dry his grapes. They involve more labor, they cost more, and they are even complicated to stack and move around... but he believes they are the best material in which to dry the grapes. Crates he bought from another winery who now uses plastic. Alessandro does make a Ripasso in addition to his Amarone, his Recioto, and his Valpolicella Classico. We toured the winery and saw the rock below the vines (there is a wall on display that even has fossils from the time this area was under sea level). Fossil seen on tip left quarter of this photo. 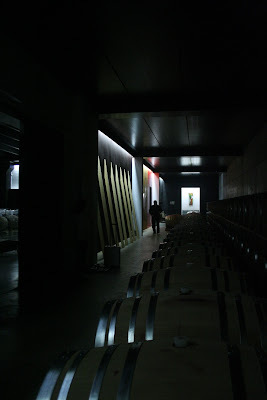 The end of the tour, seeing Alessandro's private cellar. Joking aside, I'd like to mention the sacrifice and hard work the wine makers put into these wines. Ettore uses modern methods but refuses to make a modern Ripasso style red, while Alessandro clings on to the more old fashioned wooden crates but makes the wildly popular Ripasso in addition to his selection of tradition wines. Both have been making wine for about a decade, and both have very clear visions (and make nice wines!). ...and be sure to contact me for a food and wine tasting class or intinerary in Florence, Italy.